Small Batch Blackberry and Apple Jam Recipe. Traditional and tasty! This easy small batch blackberry and apple jam is quick to make and produces delicious results. It couldn’t be more British! Three ingredients, no added pectin. I’ve been making a lot of small batch jams and preserves with blackberries recently, but have saved writing up this small batch blackberry and and apple jam until last. It epitomizes the great things about small batch jam making – quick, easy and delicious. I can easily see myself making some on a spare hob while cooking a meal, to give a couple of jars of deliciously fresh tasting jam. 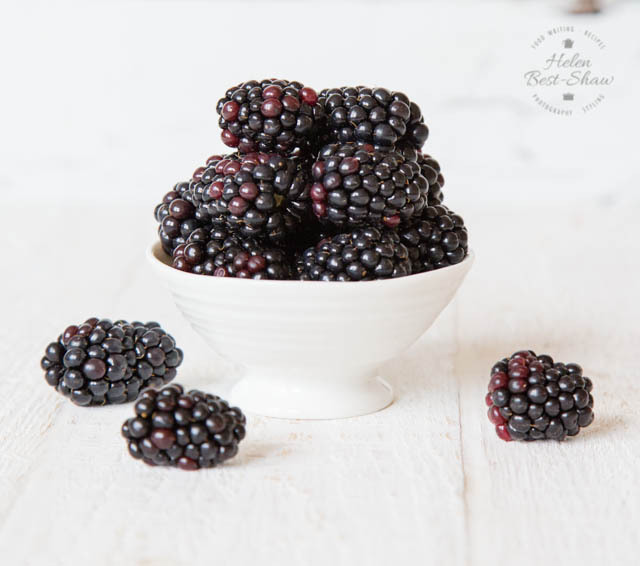 Blackberries are so delicious in so many ways: straight from the bramble bush, combined with apple for a traditional crumble, or as here or one of our other recipes into a small batch blackberry jam or blackberry and apple jelly. This recipe hits a real sweet spot of ease of making and taste. 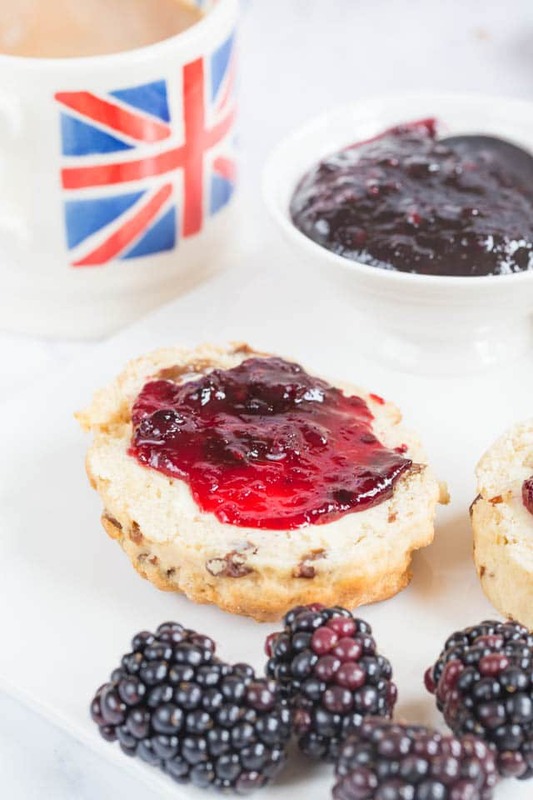 Unlike our blackberry and apple jelly, there’s no need to spend any time straining the fruit, and compared to the straight blackberry jam, the addition of Bramley apples and their natural pectin makes it so much easier to get the jam to set. 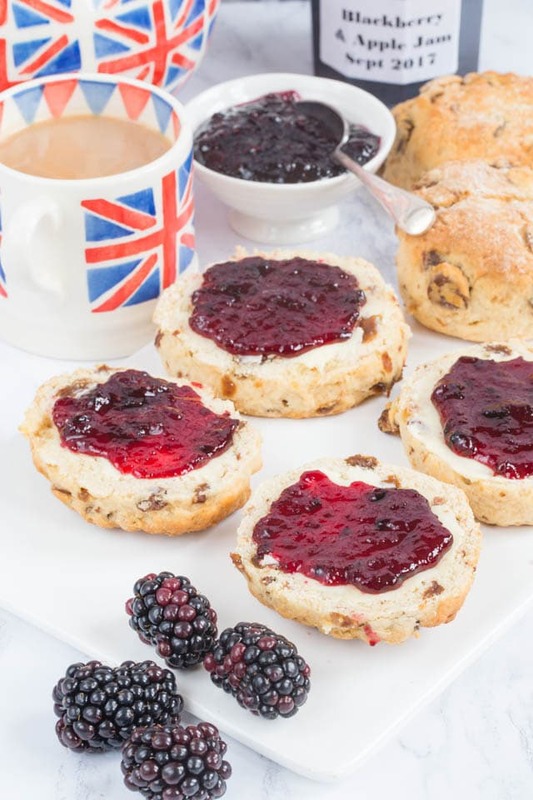 One other advantage I find is that by making jam, rather than jelly, including all the fruit makes it easier to spread on a scone, muffin, toast or whatever. Jelly is lovely, but it doesn’t spread like jam, although its huge upside is no pips! You really must not make this too late in the season, once the weather starts to cool the blackberries become hard and dusty, not good for jam, and a disappointment when you open the jar. We only made 3 jars this year, as we are keen to avoid another jam glut caused my my over zealous preserving from 10 years ago – I’ve just opened the last jar of the 2007 apple jelly! About half of my stash of homemade preserves – photographed in 2010! About 7 years supply! First Stew the fruit until they have cooked down to a puree. You can help them along with a masher. Second Add the sugar and heat slowly to dissolve it, stirring it in as you do so. Third, Once the sugar has dissolved, turn up the heat to bring the jam to its setting point: test using one of the three methods detailed below (a chilled saucer, temperature or the flake test). Fourth, allow to cool for about ten minute, spoon into heated jars, screw on the top and allow to cool. One of the most delightful sounds in the kitchen is that pop of a jam lid as it cools. And so you can easily scale it up and down here are the ingredient ratios! 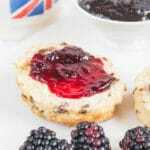 If you like this you might also like our small batch pear and blackberry jam recipe. If you try this Small Batch Blackberry and Apple Jam Recipe please tag #FussFreeFlavours on Instagram or Twitter. It is amazing for me when for me when you make one of my recipes and I really do love to see them. You can also share it on my Facebook page. Please pin this recipe to Pinterest too! Thanks for reading Fuss Free Flavours! This blackberry and apple jam is easy to make, with plenty of natural pectin from Bramley apples, and so delicious. Peel and core the apples, and add to the blackberries in a good-sized saucepan along with a splash of water. Put on a lid and cook over a low heat until the apple has cooked down. Mash apple and blackberries to make sure there aren't any lumps. Place jam jars and lids in a roasting dish and into the oven set to 140°C/Gas mark 1. Add the sugar, and stir in until dissolved. Heat the jam quickly until it reaches a setting point. Use one of our setting point tests. When a set has been reached, allow to cool for a few moments and then spoon into the jam jars, using a jam funnel. Seal the lids - take care, as the jam and jars will be extremely hot. Allow to cool and listen for the lids to pop. Store in a cool place, but start enjoying straight away!